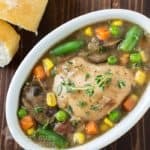 This Crock Pot Guinness Chicken Stew is a new twist on a traditional favorite. It's an easy and tasty alternative to the typical Guinness beef stew! Place the onion in the crock pot. Layer the chicken on top of the onion. Distribute the bacon and mushrooms over the chicken. In a bowl or large measuring cup, combine the Guinness, broth, garlic, pepper, salt, and thyme. Pour the Guinness mixture over the chicken, cover, and cook on high for 3-4 hours or low 6-7 hours. Add in the mixed veggies, re-cover, and cook until they are heated through, about another 20 minutes. Bone-in chicken thighs produce the best flavor, but honestly boneless are a really close second, and you can also use chicken breasts. Frozen chopped onion is a great alternative to fresh. It's easier to use and keeps for much longer in your freezer. If you buy your mushrooms already sliced, you wil only need to rinse them quickly before using them. Use jarred minced garlic instead of fresh. No one will notice!